Produktinformationen "FUNKO IT ACTIONFIGUREN 3-PACK SET 3"
Reenact some of your favorite IT moments! Stanley Uris and Mike Hanlon represent a couple of the members of The Losers Club, ready to fight The Bowers Gang, Pennywise and any other horrors the town of Derry, Maine can conjure. Pennywise the Dancing Clown is ready to strike terror and turmoil into the hearts of the town's residents. 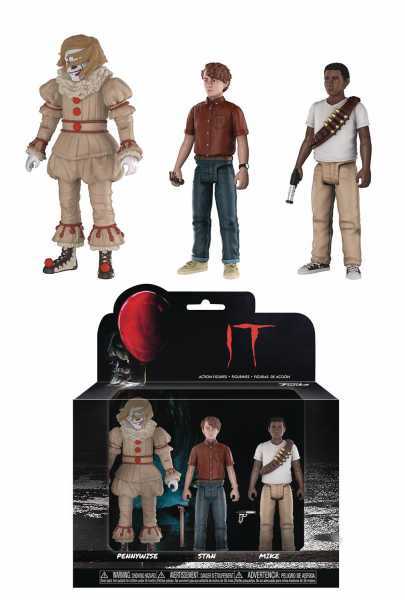 These action figures come packaged ina ITthemed window box, perfect for collectors! Weiterführende Links zu "FUNKO IT ACTIONFIGUREN 3-PACK SET 3"
Kundenbewertungen für "FUNKO IT ACTIONFIGUREN 3-PACK SET 3"